It only makes sense that we offer Vermont maple syrup. After all, the majority of what we sell is made with VT syrup. Our pure maple syrup is produced in northern Vermont and is a quality Vermont product. 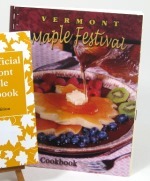 If you're wondering what you can use maple syrup for, other than pancakes, we would suggest the maple cookbooks below. Each is packed with wonderful, easy to make maple recipes. 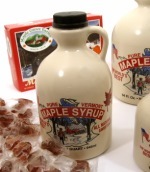 Pure Maple Syrup Gallon Jug, 128 oz. Pure Maple Syrup 1/2 Gallon Jug, 64 oz. Pure Maple Syrup Quart Jug, 32 oz. Pure Maple Syrup Pint Jug, 16 oz. 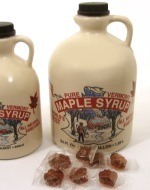 Pure Maple Syrup 1/2 Pint Jug, 8 oz.